Because of poverty, abandonment, death of parents, criminal activity, divorce, prostitution and childhood illnesses there are over 1,800,000 orphans in Vietnam right now. Most of these orphans have to fend for themselves, often working as street peddlers, beggars, prostitutes or criminals. Your gift can turn these children’s lives around by providing them with basic necessities such as food, shelter, education and much more. We have many programs to serve the poor and the orphans. Below is a listing of our programs. Each year, there are thousands of children abandoned by their parents for various reasons: economics, illness, death, out of wedlock childbirth. These children end up on the streets or in orphanages and never experience the love of a mother and father. We would like to extend an invitation to all of you to reach out, and sponsor a child to love and support. Your financial gifts will improve their nutritional, educational, and physical needs, and your personal attention will allow the children to experience the love and attention they deserve. 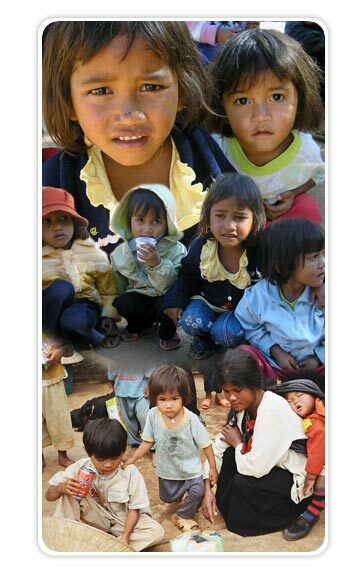 $15 support per month will buy basic essentials such as nutritional food, milk, books, clothing, and school tuition. The child will also receive a gift, cake, and their favorite food on his/her birthday, as well as a Christmas and New Year gift. We organize trips to the orphanages and invite sponsors to come along if they can. Holidays can be a very lonely time of the year for those who have no family. If you cannot commit to sponsoring a child, you can always help through donations to support our Christmas/New Year/Trung Thu and other Holiday gift programs. The gift will not only include basic necessity such as nutritional food, rice, milk, clothing, toiletries, but also Holiday special treats. For Christmas, they also include fun items such as toys and candies. The gifts are wrapped in special gift wrap and delivered by the nuns and volunteers dressing up as Snow White and Santa Claus to spread the Holiday spirit and to give the children a happy time. Since Lunar New Year (Tet) is a culturally important occasion in Vietnam, we also give li xi or so called lucky money and treat them to a sumptuous Tet dinner. They will get to celebrate Tet like other kids who have families. For August Moon Festival, the children would be treated to a nice dinner, receive decorative lanterns (long den) and moon cake. For the Children End of the School Year Holiday, they get treated to a picnic at a park with nice food and drinks. They also get new uniforms and books to prepare for the next school year at the end of the summer. For only $10 per child for each Holiday, you can bring many moments of happiness, laughter, and childhood holiday memories. Through your gifts and love you are actually making a positive impact on the children’s lives and brightening up their future. This attention will help to lay down a secure emotional and psychological foundation that will stay with them as they grow up. For only $10 per family ($5 for individual) for each Holiday, you can bring many moments of happiness, laughter, and holiday memories to a poor family. The gifts usually include food, rice, cooking oil, blanket, warm clothing etc. to help provide the poor family with meals during the Holiday and to stay warm. Many schools in the rural areas are run down and unsafe for the students. The roofs leak, the beams, windows and doors are rotted, the paint is peeling, and there are no fans to cool off the summer heat. By fixing up their schools, the children can learn in a safe and comfortable environment. For a mere $2000, we can completely fix up and remodel a stand alone school/classroom with the capacity of up to 40 students. For another $3000, we can add a brand new dining hall, a bathroom and a playground for each 40 student capacity. For poor parents who work in the rice field from morning to evening, we also provide free daily lunches so their children are able to go to school and stay through lunch. Many orphanages are run down and the living conditions pose health hazards for the children. We provide a safe living environment by fixing up and remodeling their orphanages, and providing better amenities. For a mere $2000, we can completely fix up and remodel an orphanage, improve their living standards, and provide safe, clean, sanitary conditions for the children. There are many poor families in Vietnam who are homeless or live in run down huts that are very unsanitary. Many of these people are ex-lepers (nguoi cui) and are outcast by society. Some have legs and arms that have been amputated because of the disease. They live on the streets or in leper colonies and often beg for food. Currently, the local government does not have any programs to help these families with shelters or food. For a mere $1000, we can build a small two-room cement home for a family of four. For another $200, we can have a well dug to provide clean water for the family. These people will not have to live on the street anymore. They will finally feel the love and dignity that they deserve as a human being, and will forever be grateful to those who helped turn their lives around. We also provide educational assistance to poor students who have a desire to continue with their education but cannot afford to. For a mere $15 per month donation, we can provide tuition, books and uniform for one child and allow the child the opportunity to continue with his/her education. We follow through with each child and continue our support after high school to ensure that they will be able to continue with higher education and obtain a college degree at a quality school. We provide medical and health services to the poor and orphans by involving member doctors, dentists, optometrists, and other health professionals to travel with us in our trips to Vietnam to give lectures at local hospitals, to provide medical treatments and to give medicines to the poor and the orphans. We also bring severely burned and handicapped children to the USA to obtain surgery and treatments that are not otherwise available in Vietnam. Besides helping the orphans, the poor and the handicapped of Vietnam, we regularly serve the local community in Houston, Texas by visiting nursing home, feed the homeless, providing Christmas gifts for the homeless and the poor children, and volunteering in charity organizations and projects. Messengers of Love members, sponsors and guests make regular trips Vietnam to visit the orphans and the poor, and to oversee the building and remodeling of schools and orphanages. Our local Vietnam Messengers of Love group also makes many trips per year to the poor and handicapped in various locations throughout Vietnam to give food, gifts, and medicine. Read about MOL past projects and accomplishments.